It takes no more than two to three seconds to strap-in, and it is the single most action you take that can save your life in the event of a crash -- yet they are still many people who refuse to buckle-up before taking off in their cars. 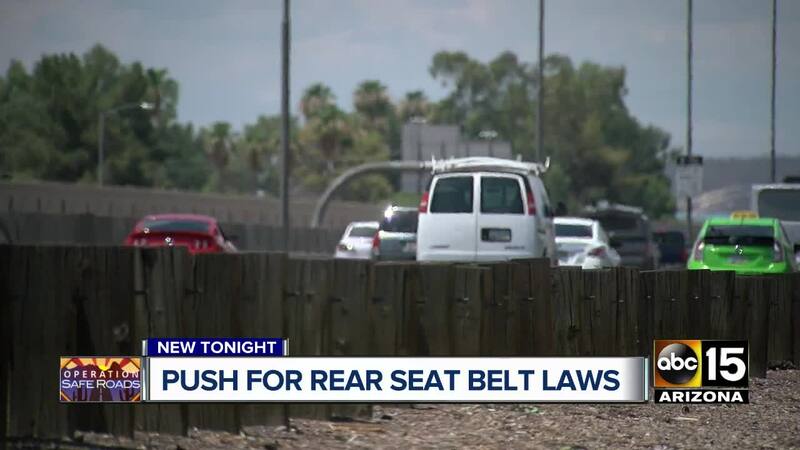 While the Governor's Office of Highway Safety touts a high-rate of seatbelt usage in Arizona, the numbers only account for drivers and passengers buckling up in the front seats of the vehicle. The number of people buckling up in the back seat is much lower than those buckling up in the front seat. Studies show rear seat passengers are three times more likely to die in a car crash if they are unbelted, and a driver wearing a seat belt is more than twice as likely to be killed in a frontal crash when an unbelted person in the backseat is hurled forward. At a time when Arizona road fatalities have increased by more than 7 percent since 2015, it begs the question: Why is Arizona one of about twenty states that do not have a rear seatbelt law in effect? It is a question road safety advocates have been asking for a long time. "The National Safety Council has repeatedly called for every state to pass a primary seatbelt law in every seat of the car including the rear," said Maureen Vogel, a spokeswoman for the National Safety Council. Jessica Jermakin, a Senior Research Engineer with the Insurance Institute for Highway Safety, added that unbelted passengers could also risk the lives of other passengers in the vehicle. "An unbelted rear seat occupant will go flying forward and potentially injure or kill the front seat occupant," said Jermakin. As horrifying as that sounds, Chandler high school teacher Dr. Melinda Parry knows first hand what can happen to those who choose not to buckle up in the backseat. "As a result of it I ended up becoming paraplegic," said Parry. The popular college athlete was attending her freshman year at the University of Arizona when her life changed. A fun trip to Mexico ended with a horrible crash when the driver lost control of the car. Parry said she was in the backseat, her feet wedged underneath the front passenger seat which was reclined all the way back, as the front passenger was asleep. Parry, who described herself as a stickler for the rules, decided to forego wearing a seatbelt for the first time in her life. She said she didn't think much of it as it was not a law to buckle up in the back seat. "We had justified it. The doors were locked, the windows up," said Parry. When the driver lost control of the car, leading it to roll over several times, Parry suffered the most brutal impact. "As the vehicle was rolling I didn't have a shoulder harness on, without a shoulder harness, and my legs pinned, my back moved. It was too much force. It broke my back," said Parry. Now, Parry is a big advocate for rear seatbelts and said she preached the safety message to all of her students. "They're gambling with a lot if they don't buckle up," said Parry. Mesa paramedic and firefighter Captain Tim Burleson also saw the impact on victims first hand, after responding to at least 250 crashes throughout his career. He had seen bodies thrown from vehicles, sometimes more than 50 feet away. Burleson recounted having to use thermal imaging cameras in a field where a crash had taken place because the victims had been thrown out of the car, and they could not find them. "The bodies will find an exit to leave that vehicle," said Burleson. "It always amazes me is how a human body can fit into a tight space. Imagine where your feet are in a car and a whole person, an adult folded up into that small area," he added. When asked if Burleson felt Arizona should put a rear seatbelt law into effect, he called it a "no-brainer." The latest crash statistics listed by the Governor's Office of Highway Safety indicated that almost a third of the 962 people who died in a car crash in 2016, 329 people were not wearing a seatbelt. Road safety advocates said they have been urging states like Arizona to take action and help save more lives on the roads. "We know that people will change their behavior if we have a stronger law in place," said Maureen Vogel, a spokeswoman with the National Safety Council. Right now it is the law for both the driver and passenger of a car to buckle up in the front seats. Law enforcement and highway safety officials will tell you seatbelts work, but there is no argument seatbelts save lives. Alberto Gutier with the Governor's Office of Highway Safety said their research showed 87 percent of Arizona drivers were following the front seatbelt law. If that is the case, we are questioning why not enforce the same law for back seat passengers as well? Gutier said he would support such a law, but a state lawmaker would have to take up the cause and propose it in the legislature first. Right now there are 29 states and the District of Columbia that have laws requiring you to buckle up in the back. You can read about the Insurance Institute of highway safety study on rear seatbelts here .